Between the middle of June and July 25, we fought our way through the obstacles that state bureaucracies put in the way of people trying to retire, sold our house, packed, moved into the condo we'd bought in Minneapolis, returned to close on the house, returned to the condo to resume unpacking, brought to Goodwill three station wagons full of stuff we'd overoptimistically thought would fit into the condo, made final arrangements for RV insurance in Europe and RO-RO shipping from Baltimore to Zeebrugge, bought one-way plane tickets, Baltimore to Minneapolis, arranged three separate piles (the trip to Baltimore, but returning to our condo with us; into the RV, and staying there when it gets on the ship; and going to Europe, but not until we fly to Belgium to meet the RV when it gets off the ship), and sold the older of our two cars. On the way to Baltimore we've made plans to visit with no fewer than two children, one new granddaughter, and at least three, maybe four, sets of brothers and sisters, as well as spouses and assorted nieces and nephews. Why should it be easy? As I write this, we're two days into the trip halfway across the country. We survived Chicago yesterday and anticipate doing the same with Cleveland tomorrow. And we're determined not to travel this way in Europe, i.e., $100 worth of gas every day, nothing but interstates at 60 mph, staying at Jellystone Parks and eating restaurant food for lack of anything better. But we're traveling this way because we have deadlines: by August 6, we have to get our RV through Customs in Baltimore and onto the parking lot of the shipping company, who insists that we get it to them 4 working days (and two weekend days) prior to the sailing date of the Texas on August 12. Did we say August 12? Surprise: at the last minute it became August 11 instead. And if Rover had made it onto the Texas on that date, as planned, we’d have met her in Zeebrugge by now. Instead, we’re back in Minneapolis. We were on our way out of Vermont, heading to New York City when we received a phone call from our freight forwarder, who asked, "Can you get to Baltimore tomorrow? The ship is coming in a day early." (Note: this was August 4th and the ship is coming in on August 10th.) We said we would try but that we hadn't had any luck in finding anyone who could purge our LP gas tank. She gave us the number for someone who could take care of the LP gas and we decided to skip NYC and headed directly for brother George's in Philadelphia, where we repacked everything for shipping. Early the next day we headed for Baltimore with 3/4 tank of LP gas. On the way we called the Baltimore LP gas number our freight forwarder had given us. They said they couldn't help us but suggested we call so and so. So and so couldn't help us, but gave us the number of United Propane. Hurray, United Propane said they would help us and they were right on the route to the port. We pulled in around 11 a.m. and the dealer told us to "just pull it up over there." We did; he then simply opened the valve to let the propane bleed out. "This will take a while, maybe several hours," he said. So, in the meantime, we called a cab, who took us to a car rental agency. We drove the rental car to the shipper's office to pay for this whole adventure and then drove back to the propane dealer, where the gas purging was going very slowly. We emptied into the rental car all the rest of our stuff that wasn't being shipped. It is a little scary going in and out of a vehicle smelling of leaking gas. Finally around 3 p.m. we realized that the gas tank would not be emptied in time to get it to the port by the 3:30 deadline, so we simply decided to be there first thing in the morning. We left the motorhome at the propane dealer's overnight, and the tank was empty when we showed up at 8 a.m. the next morning. We had been told that delivering the motorhome to the port would be as easy as returning a rental car. It wasn't difficult, but the Port of Baltimore is huge, and directions and signage were not definitive about where we needed to go. We were stopped at two different gates (by this time, Susan was driving the rental car and David was in Rover, making it a little difficult to discuss options. But we found the customs shed, where the officer looked David in the eye and asked, "Is there anything in the motorhome that shouldn't be there?" We could safely answer "no" to that question. He stamped a bunch of papers and we were on our way to the shipping terminal two blocks away. We stood in line with a bunch of truckers, had a bunch more papers stamped, were told where to park the motorhome and wait for someone to check us in. We waited over an hour in 90+ degree heat by a row of already checked-in motorhomes for someone to show up and tell us exactly where to park. Finally someone did, we parked it, locked it, handed over the key and took off the license plates. We were also told we could check online to find out exactly when our vehicle was loaded on the ship. We congratulated ourselves, got into the rental car, and headed toward our son's place in Washington D.C. So back in Minneapolis we’ve been logging in on the shipping company’s website each day. There we can track our new ship, the Taiko, as she tries to stay ahead of Tropical Storm Fay: Miami a couple days ago, then Savannah today; then New York, then she doubles back to Newport News (why? ), and finally doubles back yet again to Baltimore (again why? ), where Rover patiently awaits. We’ve decided to buy our plane tickets as soon as we hear Rover has actually been loaded in Baltimore, rather than wait until getting notice that the ship is about four days from arriving in Zeebrugge. Arrival had originally been scheduled for September 3, now September 5, but we’ve been told even this one can change, and if we got tickets now only to find that the ship's arrival was further postponed, each additional day of sitting around in Brussels waiting for it to arrive would cost a lot of money. On the other hand, of course, in the past two weeks, the cost of airfare to Amsterdam has increased a few hundred dollars and the number of open plane seats going there has decreased pretty drastically. Rover is loaded on the Taiko and is on her way: we finally have confirmation on the Wallenius website. Our next dilemma: she is supposed to arrive on Sept 6, which is a Saturday. This may mean that we would not be able to get her through customs until Monday, Sept 9, losing another couple of days. But at least we can buy our airline tickets now. (We used a travel agent who had access to a consolidator, and the tickets are much cheaper than we'd found on Travelocity.) We'll be flying out from MSP Thursday afternoon, September 4, arriving in Amsterdam early on Friday morning; we will then take a train to Brussels or Brugge. As early as Saturday (or Monday if we have to), we'll take a cab to the shipping agent's office in Zeebrugge, about half an hour from Brugge. Herewith, the exhausting details of arranging to pick up a motorhome when one is a stranger in a strange land. We had received confirmation that Rover had been loaded on her ship and that we would receive an email early in the week detailing the procedure for picking her up. But by Wednesday noon we hadn’t heard anything, and since we were flying outThursday at noon, we once again called our freight forwarder in Baltimore. She told us that that information would come to us from Zeebrugge, but she would try to hurry them up. That afternoon we finally received the information: the ship would indeed be unloaded on Saturday, we could pick up Rover on Monday, and we had to see a customs clearing agent 48 hours in advance. Suddenly we had something to do on Friday besides get to Brugge and find a hotel. When we met the customs clearing agent we would need our passports, the title to the vehicle, proof of insurance, and the bill of lading. We had received nothing that looked like a bill of lading and again called our freight forwarder. Surprise, surprise: she said that too would come from Zeebrugge and (all together now) she would try to hurry them up. But nothing. So we called again on Thursday morning and told her that we were leaving at noon for the airport. And we did . . . without the bill of lading. The flight was the usual: too cramped for too long. Mercifully, it was shortened by more than an hour because of a great tailwind. We arrived in Amsterdam at 5:30 in the morning (10:30 pm our time), missing a whole night’s sleep. Because of the great public transportation, we were able to take a train directly from the airport to Brugge, changing trains in Antwerpen. We were in Brugge by 10:30 and in a hotel (by bus) by 11 am. Since our room was not ready, we left our luggage and walked a short block to the library, where we purchased internet service good for a year. We got our email, including the bill of lading! We printed it (it had been sent at 11:57 am Thursday, about a minute after we’d locked the door to our condo in Minneapolis) and headed out into the rain to find a taxi. The taxi ride to the customs clearing agent’s office was €38. Money well spent, because we never would have found it on our own. We had to wait for the agent for over an hour. Then he talked to us for about five minutes, collected the necessary papers and disappeared for another half hour. We were trying desperately to look awake and intelligent and responsible enough to drive our large vehicle on their narrow roads. He returned and said that everything was taken care of: we would have no problems with customs on Monday, they would only have to inspect the vehicle, and “that will be €75, please.” When we asked if there was a bus or train we could take back to Brugge, he seemed to take pity on us and found a friend heading in that direction to give us a ride. By 4 pm we were napping in our hotel. We had been awake for 29 hours straight; during that time we had been in 2 taxis, a light rail car, a tram, an airplane, 2 trains, a bus, and a private car. All we wanted was the motorhome. Monday, maybe Monday. After all the anxiety and frustration of the previous Friday, picking up Rover on Monday turned out to be very simple. Another taxi ride (€52 this time), less than a two-hour wait in the shipping company’s office on the dock, and literally a thirty-second customs check: then we put the license plates back on, affixed the "USA" decal (a requirement, not jingoism) and were on our way. The first thing we had to do was stop for gas (about $9/US gallon). We were delighted to find that we could also fill our LPG tank at the same station for about €2.40 /US gallon. Not only that, but we didn’t need any special adaptor fittings--like, for instance, the ones we had paid $170 for that we’d been told we would need. Instead, the supply hose had a fitting that we screwed on to the tank’s input, and we filled it just like you fill a gas tank. It shut off automatically at the necessary 80% full. The ease of the operation may be a result of the increasing use of propane for automobile fuel in Europe. We drove south along the coast of the North Sea, never actually seeing water, stopped at a grocery store, and found our way to a lovely rural campground outside Bredene, near Oostende, with many permanent trailers. We’ve seen about five people in the campground, so we think most of the units belong to people who come in on weekends. There are bike paths everywhere and we intend to use them. We spent the afternoon unpacking and putting everything in its place. Now that we are here and have cleared customs on both ends, we can admit that we did not ship the motorhome empty as the shipper required. (Neither does anyone else whose webpage we’ve read on the subject.) We had put locks on the underbed spaces and closet and filled them with everything--linens, dishes, tools, some food, two folding bicycles, pots and pans, clothing, cleaning supplies, books, bedding, folding chairs and table for outside--so it looked empty. On the plane we carried with us some additional clothing and the computer, camera, gps, and telephones. Our two checked suitcases were not full. When we inspected Rover, we found everything just as we had left it, although we could tell that a few of the unlocked cupboards had been opened. All in all, it is a great relief to be here, to have everything with us, and to be recovering from jet lag. Our biggest problem right now: David cannot find his passport. After a call to the shipping company, a visit to the campground office, and a second and third examination of everything in Rover, we found the passport in one of the outside storage boxes and have no idea how it got there. But it was a huge relief and will keep us from having to contact a US embassy somewhere. The only benefit to all of this is that we have packed and repacked everything several times and now know just exactly where everything is. And we still have some empty cupboards. We then drove south to the area around Ypres, the site of one of World War I's bloodiest battles. We caught up with the "Flanders Fields" tour signs and followed them around the narrow streets in the center of town...and out again. The tour took us to several British cemeteries and to the museum in Zonnebeke. It was all very stark, very sobering, very factual. The museum and each of the cemeteries had registers in which visitors were invited to record their thoughts. We have now stayed in three different campgrounds. All have been very clean, quiet, and well kept and we have felt very safe. The first two had many permanent trailers and we saw very few people. They apparently come out only for weekends. Because we are now in the “low” season we aren’t even bothering to make reservations--we just show up, and there have been lots of open spaces for us. We are now in a campground just outside of Amsterdam where there are many tents and motorhomes here for short stays. When we left the campground in Belgium this morning we needed to find an ATM. We were turning around for the second time in a large parking lot when a young man pulled up beside us and asked “Are you really from Minnesota? Can I help you?” We told him we wanted to find an ATM and he told us to follow him. We drove just a couple hundred yards around a couple of corners and parked in an open square. He told us to walk around the church where we would find a bank and he would meet us there. We did and he did; he then invited us up for coffee in his apartment just upstairs of the bank. It was great to have a good cup of coffee and also to have someone else to talk to. He had sent some time in various US cities and was eager to hear how we had shipped Rover. He graciously answered all our questions about road signs and then gave us his phone number and email address in case we had more questions in the future. His hospitality was so generous and genuine. It really made for a special beginning to our day. Gas today was €1.60/litre; diesel is €1.30/litre. When we left the campground south of Amsterdam today, we had the goal of securing a storage place for the winter. We had the name of a facility near the airport and fed the address into our GPS. The first turn we made put us on the A9 in the wrong direction, but were able to get off and turned around without too much trouble. The sign had simply said “A9,” not mentioning east or west. We found the storage facility easily, but knew imediately that it would probably not be able to handle a 24 RB. The owner suggested another storage place (caravanstalling) nearly next door. That road seems to be a popular place for them, old greenhouses turned into camper storage--there are at least a half a dozen places on this road. It was a tight fit to turn around in his driveway, several back and forths and one moved bicycle. The next place said they would have room for us and that they already had 3 or 4 Americans’ motorhomes. So we went into the office and filled out some papers. It will cost us €500 (around $740) to store from the end of October through March in inside storage. Everything is costing about half again as much as we expected because of the current exchange rate. This storage place is particularly handy because it is a taxi ride from Amsterdam airport. When I told the woman in the office that we were Dutch, she offered us coffee. And she was delighted to see the old money (guilders) I had brought with us. Now we will have to figure out insurance. There is only one company that we know of that insures US registered vehicles in Europe. We are reluctant to pay the $1500/ 3 months that we have to pay for liability and collision while we are on the road. But the insurance company does not offer a “storage only” reduction. And since we have already lost a valuable vehicle once before in a flood while in storage, we are not eager to leave it uninsured in a country that is already below sea level. It is a problem that does not have to be solved today. We then continued on the ring motorway around Amsterdam (we are heading north to meet siblings in a few days) and got ourselves into a fairly tight spot along a canal in a little town, parking, I believe, in front of a noparking sign. Then we found a big parking square where we stopped for lunch. We drove on the the quaint town of Volemdam where there is a lovely camperstop with electricity right by the marina. We have seen none of it. It has been pouring rain ever since we got here. 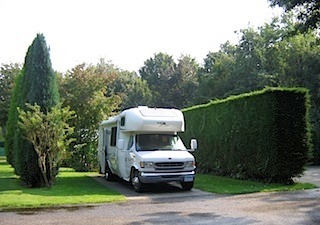 “Camperstops” are stopover places for self-contained motorhomes at little or no cost. There are some services here: a dump, fresh water, electricity, but no toilets or showers for €13. Some places offer no services except a place to park for the night. We chose not to use a free one in Ghent because we did not like the neighborhood and traffic. Maybe tomorrow it will stop raining. The rain in Volendam stopped overnight, but it was drizzling again by morning and we abandoned the idea of riding our bikes into town; instead we drove Rover to a car park in the centrum. Volendam is a tourist town. We walked past lots of shops along the harbor and bought bread, strawberries and peanuts in a street market. We see very few supermarkets: people still buy bread at the bakery and meat from the butcher. There is an amazing selection of fruits, fish, breads and beer available. We would like to find some Cheerios but are losing hope. We then drove along the dike to Edam, know for its cheese. This time we stayed out of the center of town, parking in a car park near the Information bureau. Most of the car parks are clearly marked; some are free; some have a bar across the entrance that will not allow anything but little cars. Others are marked for buses, and we have used them without incident. Edam is a lovely little place with tiny brick houses with tile roofs along many canals. There are flowers everywhere. It is unfortunate that they allow any cars to drive in the city center. One is always jumping out of the way of bikes and cars onto the two-foot wide sidewalks. There was a large camping store on the edge of town where we found out it would probably cost $1000 to equip Rover with a TV and a satellite dish, and then we would still have to purchase some service that was good only in a single country. Another problem that can wait for another day. But we are feeling a little left out of the news cycle. We get a 5-minute update from BBC on our short wave radio, which isn’t much; however, we’re finding that compressing the US presidential campaign to a single sentence isn’t a bad idea. Our real adventure of the day was still ahead of us. We had a GPS location for a camperstop in the marina of the nearby town of Hoorn. But as we headed into the town center (always with fear and trepidation) we were confronted with a detour and road construction just when we had the campground literally in sight. We had to leave the programmed route, at which the GPS lady began telling us to make U turns, first gently, then more insistently (or so it seemed). We finally shut her off, thereby losing the only map we had. This one-lane street has houses lining one side with literally a two-foot sidewalk. The street itself was maybe 12 feet wide, and small cars were parked on the right, facing a canal. Mercifully, a few feet ahead we saw a break in the row of houses: a narrow alley. And directly opposite it was an empty parking space. David pulled into the parking space and backed up into the alley. Now this may sound easy, but by now there was a bus waiting, we were drawing a small crowd, and the backing up took several back and forths. But the narrow scrape on the top left side of Rover almost all washed off later, and the longsuffering bus driver had honked only once. The nice man tried to give us directions, after which we did another couple of tight back and forths and headed back out of town. Three miles later, his directions had brought us right back to the end of that street, but this time on the other side of the obstacle. By this time I had reprogrammed the GPS lady, who was happy to give us correct directions to our destinations. Correct, however, doesn’t mean easy: these were through even tighter streets where several people backed out of our way, and at least twice I got out of the motorhome to look around corners before we dared to drive around them. The problem is that the streets are so narrow that many have been designated one way now to accommodate the cars that didn’t exist when they were built. When we arrived at the harbor, we couldn’t believe the size of some of the other campers and motorhomes there. There had to be a better way out. We treated ourselves to a meal in a restaurant that night after biking around the city and scouting out the return map the harbor clerk had given us. But on Sunday morning, leaving early before breakfast and traffic, we were sent to an even smaller street that we simply could not navigate. We deliberately went the wrong way on a one-way street to a bridge marked “2.3 m” wide and, with inches to spare, crossed it with a motorhome that measures 2.5 m. We were free of Hoorn and on our way. Soon we were on a 20-mile motorway over a dike heading east. I counted 126 wind turbines in a line along the coast near Lelystad. Now we are camped for nine days in a campground outside St Nicolasga in the province of Friesland, where my brother and sister-in-law have rented a little vacation house. We will be joined by another sister and niece and brother-in-law, and together we will be visiting the birthplaces of our grandparents. It is nice not to be driving for a few days. This is the first place where we have water at our site. There are many permanent trailers here, most of them closed up for the winter even though it’s only mid-September. Outside temperatures go down to 45 or so at night, but Rover’s LPG furnace takes the chill off quickly in the morning. We have spent the last eight days and nine nights with Rover parked in one place, but we have traveled about 700 miles with one brother and sister of Sue’s, their spouses, and one niece. and were given too short tours of Leiden and Delft by still another cousin and saw many lovely towns and villages along the way. And we were glad we weren’t the ones doing the driving. It is not unusual to look out across this flat landscape and see a church tower, a wind turbine, and a sailboat(!) in the distance. Ditches instead of fences separate farm fields, and the sailboats move along the many canals that connect the towns. There are supposedly more boats than people in Friesland; certainly there are more wind turbines than windmills; and most certainly of all, bicycles outnumber everything except maybe cows. As new residents of Minneapolis, which prides itself on its bike-friendliness, it’s humbling to see how much further the Dutch have carried that idea than we have. We have been blessed with great weather every day, although people here tell us it has rained all summer. We have found great restaurants with even greater (in the sense of higher) prices and enjoyed the wine and beer and being together. We have learned a lot about traffic signs and laws, and we had a great time with the family, but we are looking forward to being on our own again starting tomorrow. Left to our own devices for the first time in more than a week, we set off to the north and east to see the fortified town of Bourtange on the German border. We broke the journey Tuesday at Groningen, our most northerly stop to date. 2. The Dutch cities and towns we’ve seen have looked extremely prosperous: long shopping streets, few or no shuttered storefronts, successful open-air markets in addition to lots of upscale shops--many of them European and American chains--and large crowds. Groningen was no different, and the presence of about 20,000 university students probably didn’t hurt its economy, either. One of the relatives we met told us, with evident pride, that his university-educated son was making a much larger salary than he, his father, was. The American Dream is doing OK in Holland. Bourtange is a fortified village rebuilt to its 1742 glory, when it stood astride the routes other nations used to supply Dutch towns they occupied. It was begun in 1580, built in the shape of a five pointed star with triple moats and earthworks, allowing the defenders to fire upon invaders from at least two different angles--very clever and interesting. Lots of little rooms and shops to peek into. “It’s as if time had stood still,” say the town’s advertisements: well, yes, if you ignore the gift shops and the tourists and the cars. We would like warmer weather, so we did 119 miles today, some on a direct south motorway in Germany where the roads were noticeably worse and the traffic noticeably faster. We are heading back to the storage place south of Amsterdam with some questions and then on south. We are parked in Zwolle at our first real camperstop: basically a public parking lot with spaces marked for motorhomes for € 5 a night. We are a little more at ease with driving after having a week off and learning a few more signs and rules of the road. We have also seen very large trucks on very small streets almost everywhere, so we know we are not the biggest thing on the road. We watched in awe today as a large truck pulling a semi trailer went around a tight corner in front of us. Nothing seems to deter them; we look carefully ahead. The Dutch often line canals and roads with the same variety of trees in rows that seem to go on for miles. It’s beautiful to see from a distance and even more beautiful to drive through. It would probably be considered a road hazard in the US. We repeat ourselves: Haarlem is another beautiful smll city with a bustling center. Coming through narrow streets into the main market square just takes your breath away This time we did it on bicycles, leaving Rover in a tight campground 3km away. Here we saw an organ that Mozart played when he was 10. And then we had supper at Ikea. When we had been in Groningen, we learned that one of the more notorious buildings in the city is the art museum: as the story goes, somebody in charge had the idea to assign its design to three architects: each came up with a design for 1/3 of the total square footage, and the three discrete buildings were simply put end to end. If the question “Why?” comes to mind, you should probably stay away from Rotterdam, where it’s as if the whole of the central city had been turned over to half a dozen or more architects, each one determined that his building would be the one to put the others to shame. The city had been leveled during World War II, and in the decades since then, the rebuilding has taken the form of “an architectural aesthetic that’s unique in Europe, a progressive perpetual-motion approach to construction that’s clearly a result of the city’s postwar, postmodern ‘anything goes’ philosophy” (that’s from the Lonely Planet guide). There are the twin office wings that reflect one another; the elegant bridge; the one that leans, resting on a long pole; the three apartment blocks; and lots of others, including the Overblaak development and its upended cube-shaped apartments; and, oh yes, lots of others. And as far as I can tell, not a one of them cares much about “fitting in” with the buildings around it. We spent two days in Rotterdam on a boat tour of the harbor, visits to museums, and just walking around looking up, even though the campground was the most expensive yet. It was basically a large field with electrical posts around the edges. The hose for fresh water was the same you were free to use to clean out your waste hose at the dump site. Thanks, but no thanks: we have found this to be the case at several places and are careful to add to our supply of fresh water only when the conditions are sanitary. The quality of the water has been very good so far. We stayed with about half a dozen other campers in a farmer’s field, set aside as a “mini-camp,” outside Middelberg, the capital of Zeeland, the furthest southwest province of the Netherlands. We took a bus into the city center. Once again, the city center was very old and impressively large; also impressive was the Abbey, just off the centrum: three churches, side by side, a quad surrounded by monks’ quarters, and very old pulpits and pipe organs. It also has a fanciful monument remembering FDR’s “Four Freedoms”: freedom of speech and of religion, freedom from fear and from want. The connection is that FDR’s ancestors came from Zeeland. After we took the bus back to the campground, we rode our bikes into Veere, a small village that has become a sailing harbor when the dyke project in the 1960s cut off their access to the sea and ended their fishing economy. We visited an old church which hasn’t been restored but instead turned into a concert and community place. An unexpected twist. It has rained all day Tuesday, as we traveled to a campground on the outskirts of Breda: we picked this campground because it has a laundry--a good way to use a rainy day--but found that the only washing machine is not working! So we’ve done nothing more than shop for groceries today and listen to the BBC discuss the US House’s rejection of the bailout bill. Much of the coverage has been on the level of “does this represent the failure of market capitalism?” It was interesting hearing a European banker or politician say that American politicians had to act responsibly and pass the damn thing: it was clear that a congressman from Kansas wouldn’t be at all impressed by the admonition and might even be angered by it...much as Europeans must be by American blowhards lecturing them. In a development that sent stock markets reeling around the world, the Minnesota Twins lost their playoff game to the universally despised Chicago White Sox on Tuesday. Right-thinking enclaves throughout the world mourn. Except in Breda, the Netherlands, where patrons of the McDonalds couldn't understand our anguish. More later, but not about this. We were running out of clean clothes and the laundry basket was bulging. We chose one campground because it had a laundry, only to find that the single washer had stopped working. The next day we found another with two functioning machines--one load for € 7.50 (about $11 at today’s exchange rate) and we had at least two loads. The dryer is only € .50 for half an hour, so throw in another 75 cents for drying and we should be good for another few hundred miles. We spent yesterday in Breda: lots of rain and sometimes very strong winds. We were able to get into a car park without too much trouble --only had to go over one curb--and walked into the “centrum.” This one had a modern shoppng center, the ever present Grote Kerk, but also a wonderful doll house collection on the second floor of a little corner of an old monastery. We were the only visitors and they gave us coffee, as well as a flashlight to see into dark corners. 3. “It’s all part of the adventure” (we use this one several times a day). And we laugh a lot. As promised--if that’s the word--here’s a midterm assessment of the outcomes of our various expectations about this trip: which ones, so far, have been exceeded, which met, and which shattered beyond all recognition. B+ on this one. As near as we can tell, Rover has been averaging about 10 mpg, which is all we can expect; mechanically, she’s been flawless in the crucial areas. We can’t be sure about the mpg because until recently we weren’t willing to fill the 55-gallon gas tank once, let alone twice, because of the cost of lugging that much extra weight around. However, just today when we left Luxembourg we filled it up because gas there was € .30 per liter cheaper than anywhere else we’d been--that’s about $1.60 per gallon less. And it’s beginning to look like we’ll make it through the two months of our trip on a single tank of propane. There’s no way around it: the grade so far is F.
The original plan had been to travel backroads at a leisurely pace and to stop for the night in small towns as the spirit moved us. Instead, we’ve usually been on the European equivalent of interstates--and now that we’re in France, they’re tollroads to boot--going 55 mph, while everyone else does 75 or so. Today might have been our worst in this regard: 170 miles from Luxembourg city to Strasbourg, France. We had hoped to go about 50 miles a day. I think there are a number of reasons we haven’t done this. First, ever since leaving our relatives in northern Holland, we’ve had rain most every day. Backroads and hills and narrow lanes are no fun to drive on in those conditions, and I’ve succumbed to the false hope that if we only go fast and far enough, we will outrun the bad weather. Second, I’ve been very aware of our three water tanks--black, grey, and fresh--and the need to prevent the first two from getting full and the third from getting empty. So no sooner does the monitor’s level for one another of the tanks threaten to become critical in a couple of days than I start thinking we have to find a campground where we can fill one kind of tank or empty another. Finally, I haven’t yet been able to shake my Type-A habit of ‘get it done,’ ‘check one destination off the list and go on to the next,’ instead of taking it as it comes. A. Maybe A+. Except for a short stretch in western Germany, the highways have been great, and even the narrowest lanes have been smooth. The oval “USA” decal next to our rear license plate seems to elicit other drivers’ pity and forebearance rather than impatience (not to mention a lot of interest from people at restaurants and gas stations and campgrounds). B so far--but on the other hand, we’ve only today gotten into France, the country of literally hundreds of ancient cathedrals, town halls, and villages… (Cathedrals like this one at Strasbourg? Still, some of our best memories so far have been turning a corner in a Dutch or Belgian town and having our breath taken away by the sudden sight of a centuries-old Grote Kerk or Town Hall at the far end of the market square--and this despite the fact that Reformation Protestants or the 20th century’s two wars often had done terrible things to towns’ architecture in these countries. One of our wisest purchases so far was a three-day “Luxembourg Card,” which gave us unlimited travel on the buses and trains throughout the country as well as free admission to more than 50 museums and other attractions. Because we had the card, we saved energy riding a bus when otherwise we might have walked, and we weren’t particularly upset when one of the museums we took a bus to was putting in a new exhibit and had everything off limits. And we saw a couple of interesting museums we otherwise probably would have skipped for the sake of saving money. We’ve just finished a four-night stay in a campground just on the edge of Luxembourg city. This was the first camppground that wasn’t filled with permanent and rather crummy looking trailers. Instead there were people coming in and going out every day. And we could order fresh bread to be available in the morning. The laundry was only € 4 to wash and dry and the campgound was only € l3 with free showers. We have come into the sunlight! After two more wet nights and another wet day in Strasbourg, we have headed into Alsace wine country. The campground in Strasbourg was another busy transient place close to a bus stop that got us easily into the old city center. We spent the day dodging rain in the magnificient cathedral and various shops and museums and on a mini train tour of the city. The campground had no dump station, but instead we were directed to a youth hostel on the other side of the fence where there was a version of a camping service area. The dumping was free, as was the water to clean out the hose. Drinking water and an hour to charge batteries required payment of a fee. Our vehicle was about as big as one would want to maneuver into this space. We were soon on our way, stopping at several small villages along the way--each one smelling of wine. It is the grape harvesting season, and new wine is being processed. We stayed at our first “France Passion” stop: we have purchased membership in a group that allows free overnight parking to motorhomes that are self sufficient. There are no services available--just a free place to park for up to 24 hours. This winery (where we tasted a little wine and bought a bottle) was just down the mountain from the Haut Koenigsbourg castle. That was were we headed the next morning--only about 5 miles up a narrow winding road to the top where motorhome parking was well marked (but leaving a half mile hike up the mountain). The castle was wonderful, a real highlight of this trip so far, made even more beautiful by the gorgeous fall colors and the sunshine we had been hoping for. It was the 100th anniversary of the restoration of the castle, and it is impressive. We are at another France Passion site tonight, a rather shabby restaurant/winery, but we were invited to a new wine party. We had been told that after three glasses of wine we will be speakng French. It didn’t turn out that way...but we didn’t care! The party was actualy a reunion of a group of people who were all born in 1946 and went to school together, so we pretty closely fit in (we were a year older, but looked better). We stayed off to the side with another motorhome couple who did their best to make conversation with us. They come to the Alsace region every year to fill their motorhome with wine. The food provided was very odd to us: cold sliced ham and bacon (that looked nearly raw), walnuts in the shell (we were provided with a hammer and a small block of wood), nut bread, and of course, wines. We were given four different kinds (the bottles left on the tables for refills), and one pear brandy that was 54% alcohol. We were glad to only have to walk 25 feet back to Rover at the end of the evening. All in all a very good day. We looked at the map and decided we were too close to Switzerland to not include it in our non-existent itinerary. So we left Colmar and drove into Germany, following the Rhine south to Basel. This is the height of the fall color season and it is beautiful country. We were brought down to earth when we learned that Switzerland collects road taxes at the border on all trucks: that piece of information cost us € 17. (“We learn something every day, to our cost” (Tom Stoppard, Rosencrantz and Guildenstern Are Dead). Warning: the following deals with European toilets, so if that topic doesn’t appeal to you, skip this paragraph. We have learned to save the ends of toilet paper rolls and carry them with us, because you never know whether it will be provided when you need it. Some places simply do not provide it; others have huge major league rolls; still others have it locked down so it can’t be stolen; or it may be for sale in the office; and a few others just have it out there, like both you and they were real civilized and sophisticated. One place had a single roll by the sinks. Toilets seats are also not always considered a necessity. Since we have been in France, we have encountered several toilets without seats attached. And we have seen several continental toilets, where you simply position yoursef over the hole in the floor (a maneuver we have avoided so far). Virtually all are reasonably clean, and in the campgrounds they and the showers have generally been well cared for. Since our hot water does not want to get very hot, we have been using campground showers. There is sometimes a charge of €1 for their use, but many are free. Toilets are always free in the campgrounds but not always in public places. Between toilets, toilet paper, and our obsession with the levels of Rover’s water tanks (is the fresh one nearly empty? are the grey and black ones getting full? we know the tanks' monitors aren't accurate, but just how far off are they? ), quite a bit of our psychic energy is devoted to sanitation. After another night and day of rain (the first in quite a while) we are now in Auxonne, France, parked right on the Saone River. We knew nothing about it but discovered Napoleon presiding over the town square, complete with an impressive Romanesque church and a marker commemorating the place where the "liberating forces" of the Allied armies of the Rhine and Danube campaigns linked up. In Baume les Dames, the night before, we saw a Montana license plate on a Winnebago but did not meet the owners. We did talk with a woman from Switzerland who said she and her husband had shipped their motorhome to the US seven years ago for seven months. That campsite was full of caravans and motorhomes, some of them substantially larger than Rover, all of them driven by people our age or older. Most seemed interested in seeing the fall colors. We arrived in Baume les Dames after striking out at Mandeure, where a campground the guidebook promised was open wasn't: however, we were delighted to find what the signpost said were the ruins of a "Gallo-Roman" theatre. It made the extra miles worthwhile. 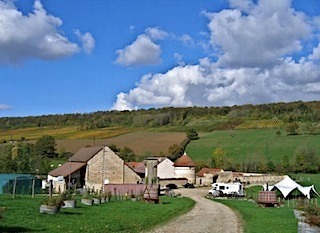 We have sent the last two days in beautiful sunshine and gorgeous fall colors in the Burgundy region of central France. On Friday we drove to another France Passion winery below the medieval village of Flavigny sur Ozerain (where “Chocolat” was filmed). We parked Rover at this very busy vineyard and walked the two kilometers to the village at the top, only to find a large empty parking lot that could have handled Rover easily. We walked the streets and took far too many pictures because every time we turned a corner we were confronted with picturesque scenes that called out to be immortalized. The only way to sit down to rest in many of these places is to find a cafe or bar, so we bought a cup of coffee (always the tiny espresso cups) and rested up for the 2 km walk back to the vineyard. At least this time it was downhill. Later we visited the winery’s tasting room and added to our collection (especialy since we weren’t having to pay for an overnight parking place). It was 35 degrees overnight and very foggy when we got up on Saturday morning. Today was to be another visiting historical sites. But this time we weren’t going to be afraid of parking. We drove to the chateau of Bussy-Rabutin. Some roads were very narrow but all were passable. Our biggest delay was waiting for the bakery delivery truck delivering fresh baguettes. The fog burned off as we drove up the hill and the chateau was especially lovely on such a beautiful day. It dates from the l6th and l7th centuries: apparently the owner got in trouble for writing a satire on the goings-on at the French court and was banished from it (a lesson many artists have learned), so, being rich, bored, and talented, he built a chateau and decorated it with portraits of the great and near-great he had known, often accompanied by malicious little verses about them (some people never learn). Then it was off to find the Fontenay Abbey in a valley not too far away. Parts of this Abbey date to the early 1100’s. It is an amazing collection of buildings: a church, monks’ dormitory, cloister, forge, kennel and more. About half of them are open to the public. Beautiful gardens and grounds surround the whole place. The guide quotes some particularly aesthete words by George Dudy: “To fully grasp the meaning of Fontenay and the power of its beauty, you must approach it step by step, painstakingly trudging the forest footpaths through the brambles and bogs in an October rain.” Alas, we didn’t . . . and we left the whips and chains behind, too. We drove Rover right up to the large parking area in the bright sunshine and enjoyed it anyway. We have spent the last two days prowling around the centre villes (city centers) of Avallon and Auxerre and stumbling upon the medieval village of Vezelay. In Avallon we were given a personal tour in French of a remarkable costume museum, by a little old French lady, wrapped in a shawl, who could barely make it up the long flight of stairs. She just ignored the fact that we barely understood anything she said. But the costume collection was quite wonderful, even if it was moldy in places. And it was quite effectively displayed in rooms decorated to match the period of the costumes. The rooms were filled to overflowing. Avallon was where one of the pedals fell off David’s bike. Our folding bikes attract more attention than our Minnesota license plates. David had been unhappy with one pedal and managed to strip the threads while trying to fix it. Remarkably, it fell off as we rode back to Rover, which happened to be a good half mile away, all downhill. The next day we found a Menard’s type store called “Bricoland”--the whole thing would fit in Menard’s lighting department--and purchased some nuts, bolts, and washers and David created a new pedal. We were off on our bikes again this morning--to a street market in the rain--to buy our baguette. After the bike incident we started looking for a campground. One we were looking for had an extremely tight looking entrance, so we drove on to another that turned out to be a treasure. The camping signs led us to Vezelay, a medieval walled village high on a hill. After we found the only level spot in the campground (tire wedges are required), we walked the ten minutes to the village. Since it was Sunday night after 5 PM we were not expecting much, but were surprised to find lots of people, open shops all on a single street that went basically straight up to the basilica at the top. It is said to contain relics of none other than Mary Magdelene, who is said (at least by the French) to have made it to France toward the end of her life. It was a beautiful clear day and the views from the top were pretty amazing. Today we spent getting lost and getting into and out of centre villes, driving white knuckled at times, trying to find a campground in the rain. The bicycle museum we finally found was closed. The campground is right on the edge of the village of Grez sur Loing: the guidebook says, “Do not try to tow a camping trailer through the village.” We approached it from the other direction and we will be sure to check it out before we head that way tomorrow towards Fountainbleau. We are very aware that a week from tomorrow we have to be in Amsterdam, cleaning Rover and packing, because we fly out on Thursday the 30th. Negotiations about where to spend these last few days have begun. Fontainebleau makes no effort to provide parking for motorhomes or anything else. We curled through some pretty tight streets before parking half on a sidewalk and half in the street like everyone else and then walked and walked back to the very grand and elegant entrance. It is a wonderfully preserved place, home to Napoleon and more than a few Louis and Henris. Fortunately an audio guide was provided in English. A German couple stopped to talk to us when we got back to Rover. They had toured the US in their motorhome a few years ago. Then it was on to an overnight on a farm. We saved the address because he has a huge storage building for motorhomes and is about 40 miles south of Paris. We filled our gas tank in that town, where gas was € l.26 per liter (that’s about $ 6.50 a gallon, almost as good as Luxembourg). The financial crisis, which is about all we hear about on the BBC, is definitely helping us in the dollar-to-Euro exchange. The next day we drove to Paris. We were expecting heavy traffic and that’s exactly what we got. Traffic slowed to a crawl about two miles from the ring road, but because of that we were able to read all the signs and get into the correct lanes, made it on to and off the periphery road, and drive right to the campground without any wrong turns. The campground in Paris is right in the huge park, the Bois de Boulounge, on the west side. We felt very safe there--it was gated, fenced and busy--there were very few empty spots, even in late October. (Rover is at the far left.) The bus into the city was about a quarter mile away on a little foot path that looked like it might be a little scary and isolated after dark, but every night we got off the bus on our return with about 6 or 8 others to share the path so it was no problem. We spent three days and three nights in Paris, walking and walking, enjoying Monets and Renoirs and museums and markets and Starbucks. It was gray, cool and damp. There is no evidence of high gas prices affecting anyone’s choice to drive in Paris. Traffic is truly amazing. My only regret is that we couldn’t even think about getting a picture of Rover in front of the Eiffel Tower or on the Champs Elysees. There was simply no way we were going to drive there, even on a relatively calm Sunday morning when we left. And we didn't take any other pictures, either: everyone has already seen better photos of everything we saw. We are on our way back to Amsterdam to get Rover cleaned up and ready for storage. Today was our longest day - 238 miles to just north of Antwerp, Belgium. We are in a little campground doing laundry. We refused to pay $15 a load in Paris, so we did a little by hand and hung it on a line in Rover, where it took all three days in Paris to dry. It’s hard to plan to leave towels and bedding clean when we leave. We may spend the last night before we leave in a hotel, and we will bring suitcases full of dirty clothes home with us. Generally we have been very impressed with the condition of the roads we have been on. We have run into few “men working” places and no actual detours. While we have tried to avoid the motorways--very expensive in France--and stay on the national- or department-level roads (think “US highway” and “state highway”), we have found that even these, as they go through the towns and villages, have purposely placed curbs, posts and speed bumps in the path of traffic. Even in obviously new street layouts, the road often narrows to one lane for 20 feet or so at the entrance to a town. Any school pedestrian crossing can have a raised speed bump crosswalk. Getting Rover through these places isn’t impossible, but we see semis with trailers going through these areas, often barely slowing down. Parking lots are another area where traffic is forced into specific paths. It is necessary for us to recconnoiter any parking lot for entrance/exit strategies before we commit ourselves. Road signs provide another whole level of excitement. It is necessary to know the names of other cities that may be in the direction that you want to go because you never know what will appear on the next sign. And just because a certain town is mentioned once on a sign doesn’t mean it will be mentioned again. Road numbers change frequently and are not always sign posted until you are actually on the road. Best of all, the map warned us that the French were “in the process” of renumbering roads. So I pretty much keep the map on my lap and a finger on the route. The voice of the GPS lady led us astray a couple of times and we find her really annoying, so we prefer the maps. Like I wrote once before,“roundabouts” are great way of getting back to where we really need to be...that is, if we can read the signs at them! We have arrived in Amsterdam after two fairly long days on the road from Paris. We are here a day early, so we have plenty of time to do our storage/cleanup/packing and organizing before we fly home on Thursday. We have decided to spend the last night in a hotel so that we will not be trying to wash and dry and pack bedding the morning we leave. It is raining frequently again, so we postponed a visit to the city center and started to pack. Since the last laundry, we have worn “clothes that are going home with us.” We have quite a lot of summer things we will be leaving behind for next year. Because we shipped so much in Rover, we have very full suitcases going home with us. Trying to go through every cupboard and storage area is a little tricky to do in that small space. Because the washer and dryer in this campground are so small, we spent the equivalent of $40 doing four loads of laundry, even though it consisted only of our sheets, pilowcases and the two bed sacks. But they are clean, dry and packed into space bags. We gave away the little bit of food we couldn’t use up or safely store. There are a dozen or so student types tenting here, and the “free food” bag disappeared from the shower room very quickly. We have been unable to find a place to give Rover a really good bath and campgrounds do not want you using their water or their spaces for that. The best I could do was go over Rover with a damp rag: moving the dirt around a little and then pouring water on her to rinse her off. It worked remarkably well, thanks partly to the rain. But it is really hard to do a good job on the nose of the cab where all the bugs collect. We did the best we could, and I think she looked reasonably clean. We waited until the last morning to do the plumbing winterizing. A month ago in a Luxembourg camping store we purchased some expensive camper water system antifreeze for about $40. We have since discovered that is is concentrated and we needed to dilute it with water. It should last us as long as we want to travel and store Rover in Europe. But it is a clear liquid--not pink--so it presented the problem of “how will we know when we have used enough?” My brilliant idea was to use a little red wine, so we saved a bottle. When it came time to add it to our winterizing concoction, we discovered that only the bottle was dark, while the wine inside was white. Because we had already given away or thrown everything else out, we looked around for an alternative. Literally the only single thing left was about half a cup of cold coffee. So we dumped that in and ended up with something that looked like weak urine. We completed the unappetizing winterizing and proceded to the dump and then we were on our way. Nowhere is it possible to really introduce a great deal of water to the holding tank system to flush it out. Having a short hose availlable at a dump site is an asset that isn’t always available. The two collapsible water jugs have proved to be valuable items. We can only hope that the urine/antifreeze we used will remain in the toilet to keep any odors out. On our way to the storage place we drove around looking for Mobil 1 oil for Rover. The storage place also works on engines and campers and had agreed to do an oil change. We were actually able to find two different auto supply stores, but neither had what we were looking for. So we gave up that search and drove to the storage place where they talked us out of doing an oil change after 3800 miles we’d traveled in the US and Europe since the last servicing. But we did leave them with a small list of other things to check for us and determined to bring Mobil 1 with us next year. With just a little separation anxiety we turned over the keys, gave them €500, locked the door and said goodbye to Rover and took a cab to a hotel by the airport. During this time we went into Amsterdam twice by metro and once by bus. The city center is truly wonderful with its canals and unique archiitecture. It has great public transportation and restaurants, and if you can avoid being hit by a bicycle or tram, it is a very walkable city. Everything is so close together. It is also a peaceful place compared to Paris. And almost everyone speaks English and many signs are also translated, making it easier to get around. Even in the pouring rain, it is a charming place and one of our favorites. Tomorrow we will head home. We promise one last blog entry after we have recovered from jet lag and toted up all our expenses and other interesting numbers. We are feeling blessed. While we had some scary moments, we never got into any real trouble. We didn’t sprain any ankles, back into anything (except that sign in Hoorn), lose any fillings, or even get our feet really wet. It feels good to be going home, but I have a feeling we’ll be planning the next trip pretty quickly. Actually, we have already started. Now that we have returned to Minnesota and done the laundry, we have had a chance to total up our expenses in various catagories. We have not included every penny we spent, simply because we would have had some on these expenses even if we had stayed at home (eating, for example). Our shipping costs: $4754. This does not include the expense of driving Rover to Baltimore from Minnesota. Our gasoline: $1918.73 for 2348 miles or 82 cents/mile. Gasoline in Europe started out at nearly $9/gal and ended up closer to $7/gal, thanks to the Euro/dollar exchange rate changing in our favor. We figured we were getting about 9 mpg. Our insurance for 90 days: $1431. Upgrades/additions to Rover - step-down transformer and the upgraded inverter/charger: $2600 (a one-time cost). Campgrounds for 54 nights: $1138, or an average of $30 per night. We expect them to be higher next summer during the high season. Indoor storage, Oct 08 - April 09: $695. We spent money on food, entertainment (tours, museums) laundry and internet access, no doubt more than we would have spent at home, but at the same time these were in place of, not in addition to, these expenses at home. Other necessary expenses included getting the motorhome to the East Coast port, airfare to and from Europe, and other transportation costs in Europe. About a third of our $700 transportation costs in Europe were expenses getting from Amsterdam to Brugge and the expensive taxis to the Zeebrugge port. Next spring we will spend €30 on a taxi to get from the Amsterdam airport to Rover’s storage location. We also spent $500 on gasoline (among other expenses) getting Rover to Baltimore. This trip also included visiting our children and new granddaughter in Vermont and DC. Had we driven directly to Baltimore and flown directly home, we would have spent much less. How does this compare to renting an RV for 8 weeks? We had an estimate from a rental company that estimated a minimum of $9000. Had we stayed in hotels, we estimate we could have spent between $6,000 and $10,000. And then we would have an additional expense for transportation (rental car or trains). In sum, even though everything cost at least half again as much as we had hoped, we still believe this really is the way to see Europe at a reasonable cost. And we have a lot more to see. One other note: Now that the election is over we will tell you that we wore our Obama buttons everywhere. We received consistently positive reactions. Only once did a man say he hoped McCain would be elected because it was what we (that is, Americans) deserved. We did not take that to be a vote for McCain. We never encountered anything that we would have interpreted to be anti-American.